Two North Norfolk Beach Runners donned a different vest on Saturday as Charlotte Neale and Chris Merrylees represented Norfolk at this year’s Inter-Counties Cross Country event held at Prestwold Hall, Loughborough on Saturday 10th March. Both of them, in training for marathons next month, are more used to pounding the roads rather than trails and fields, but racing against some of the best athletes in the country, they excelled. 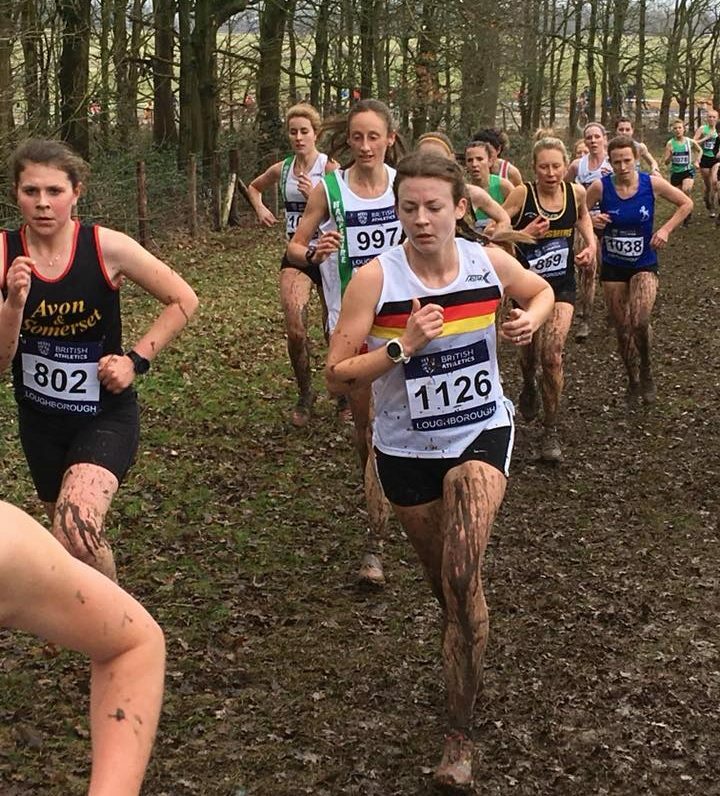 Charlotte, running in the third event of the day over an 8k course in what were described as the muddiest conditions ever for an inter-counties event, finished in 39:16 for 124th place out of 271. 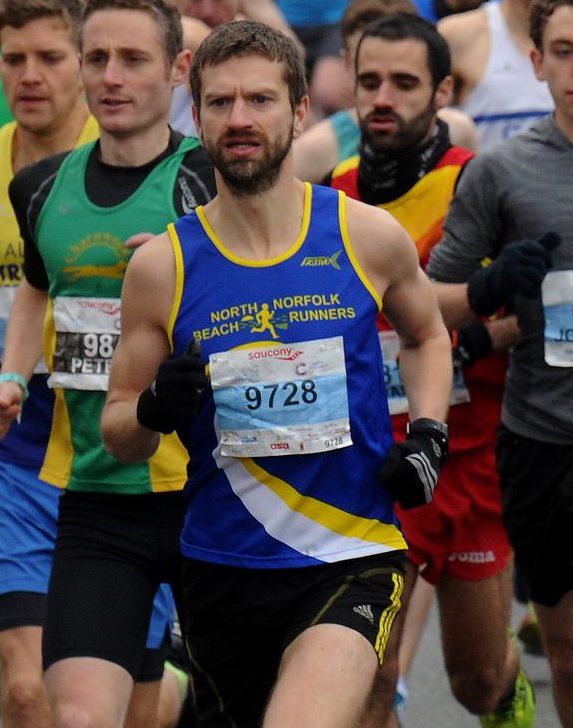 Chris was originally there in a managerial capacity; he and Dom Blake of Reepham Runners now manage the Norfolk senior men’s and women’s squads which turned out full teams for the first time for many years. But that did mean Chris getting his shoes dirty and in the final race of the day putting in a solid performance over the 12k course which, having been churned by nine previous races, was by then anything but solid. He clocked 53:01 for 222nd place in what he described as “the toughest conditions I’ve ever raced in”. This year’s Hunny Bell Cross Country has raised over £8000 for Break Charity, www.break-charity.org. The annual event, in three categories – Seniors, Juniors and (more leisurely) dog walkers – is sponsored by the eponymous pub, together with C T Baker Group and William H Brown, and run on the Stody Estate at Hunworth as an annual fund raiser the Norfolk charity’s work with vulnerable young people. It is organised by the charity in association with North Norfolk Beach Runners, the Race Director for the last decade having been NNBR club member and Stody Estate manager Ross Haddow, although this was his last year because he is moving away from the area in the autumn. He will be a hard act to follow. Forty NNBR club members provided marshalling around the course. This year’s race attracted a record entry of 500 who had a cold but sunny day and paid handsomely towards charity funds for the privilege. Winner of the 2.4 mile Junior race was Danny Adams (MU18) in 13.03 while the first girl home, and fourth overall, was Esme Abbott in14.47. The 5-mile Senior race was won by James O’Neill (M Senior) of Ryston Runners in 26.40 while first female home and 14th overall was NNBR’s own Flic Quinn (F Senior) in 31.46. 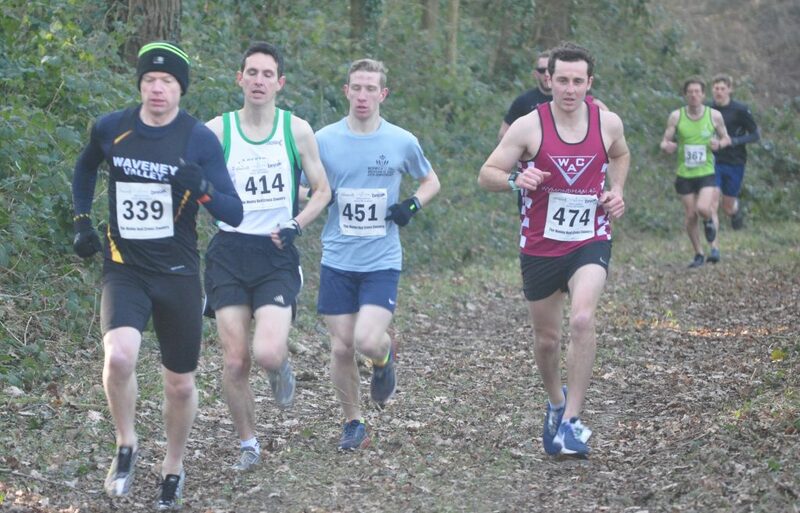 In addition to providing marshals, NNBR did have 21runners in the Senior race, first home among whom, and 10th overall, was Nick Slade (M Senior) in 31.17. And more than that, Flic Quinn, Nick Slade and Dean Howard won the Team Trophy for NNBR. 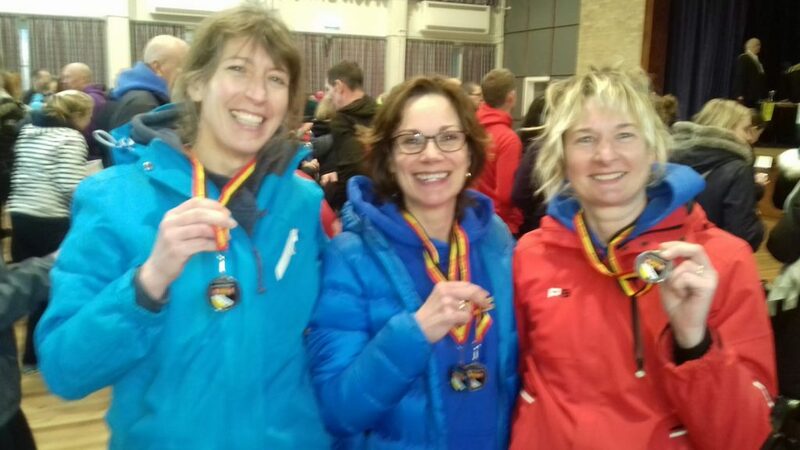 Twenty North Norfolk Beach Runners were among 521 finishers of the Valentine 10k organised by Norfolk Gazelles from Easton & Otley College, Norwich. This was the second race of 11 making up the 2018 Leathes Prior Grand Prix series and was sponsored by SportLink Running and Fitness. The first three Beach Runners home were usual suspects, Neil Adams (M40-44) finishing 9th overall and 3rd in category with a time of 35.48, followed by Adam Smart (M senior) moving even better than he apparently does on the dance floor in 37.37 for 30th place overall and 12th in category. They were followed by Charlotte Neale (F senior) in 38.58 for 38th overall and a very impressive 2nd in category. NNBR’s SuperSeventies were in action, though again categorised as M 65+ and F 65+, club president Noel Spruce clocking 58.59 for 388th overall and 12th in category, while Mike Marshall, 1.03.09, was 434th overall and 13th in category. Brenda Kinch in 1.01.49 was 418th overall and 10th in category. But Sam Weller, shortly to be a SuperSeventy, was quicker in 46.13 for 148th overall and 3rd in category, and will strengthen the squad considerably when he graduates later this year. Eleven North Norfolk Beach Runners were among 609 finishers (and 750 entrants) in the 25th running of Stamford St Valentines 30k, organised by Stamford Striders and sponsored this year by Rutland Radio. In conditions variously described as “snow/rain/wind” and “……. freezing”, the course explored the undulating lanes north of the eponymous town, commendably staying clear of the A1. First Beach Runner home was Peter Moor, (MV45) in 2.13.11.7 for 89th overall and an age grading of 68.39% while Stuart Drummond (MV40) wasn’t far behind in 2.19.54.9 for 125th overall and a grading of 62.59%. First female Beach Runner home was Lisa Oakley (FV40) in 2.26.37.7 for 169th overall and a grading of 67.19%. Meanwhile, after seven races completed out of the ten in the East Anglian Cross Country Winter League (EACCL) which take place on Wednesdays at various locations around Norfolk and Suffolk, Beach Runners are showing well in the female category. Karen Balcombe (F50) is in 18th place – and 18th overall – on 83 points while Gemma Woodrych (F45) is 25th in category and overall on 76 points and Rachel Robson (F50) in 40th in category and 42nd overall on 61 points. 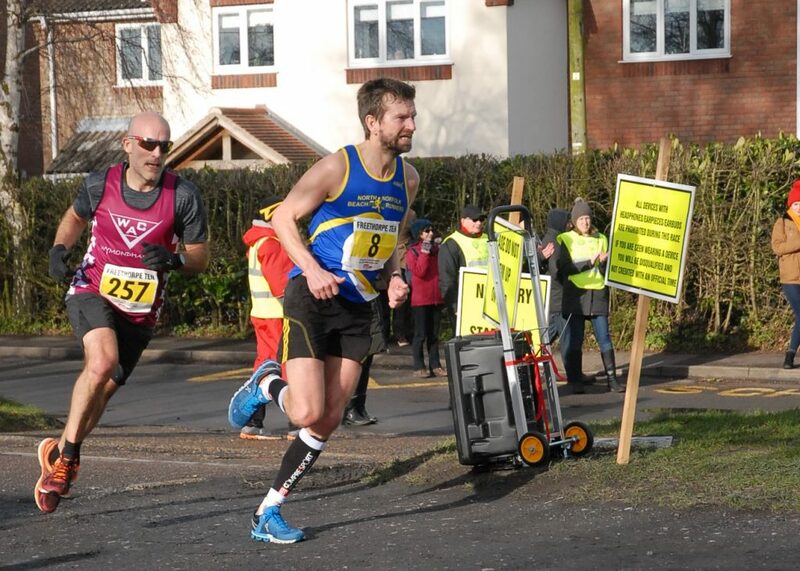 Runners have to complete a minimum of eight races to be eligible for awards and the next race will take place at Stowmarket on the 21st February. 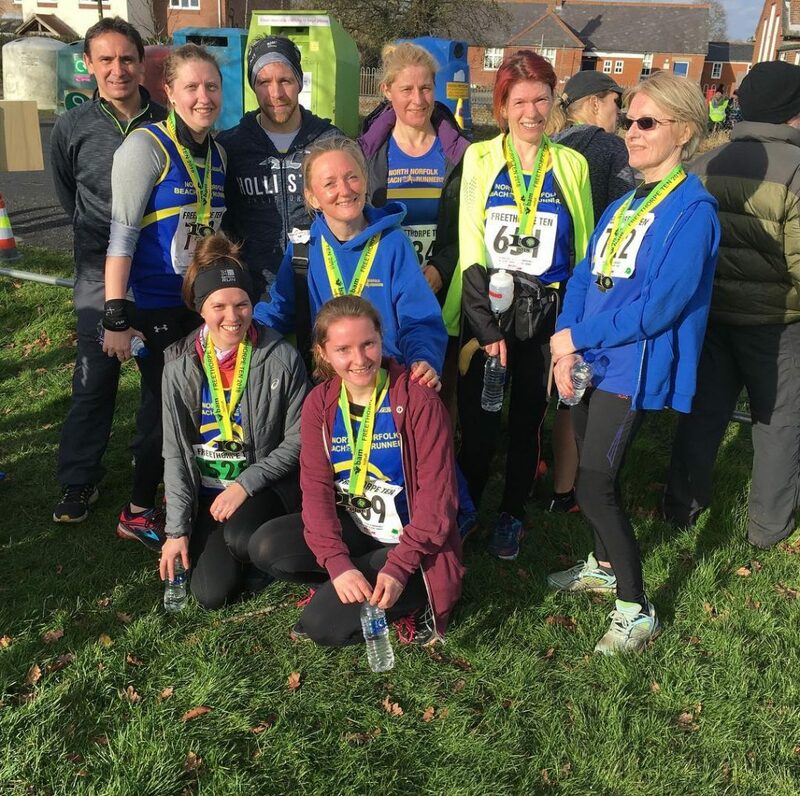 Thirty North Norfolk Beach Runners were among the 676 who ran the Bam Nuttall Freethorpe 10 mile, organised by Great Yarmouth & District Athletics Club on the 28th. In blustery but mild conditions, first home among them was Chris Merrylees, now competing in the M40-44 category in which he came second, and ninth overall, with a time of 59.17. Second Beach Runner home was Chris Parker (M Senior) in 1.01.53 for 24th overall, while first lady Beach Runner was Charlotte Neale in 1.05.00 for 49th overall, with Neil Adams (M40-44) right alongside. Two Super Seventies squad members were there, club president Noel Spruce (M70+) claiming 5th in category and 523rd overall in 1.37.40 and go-faster tights, while Brenda Kinch, classified in F 65+ though a septuagenarian, gained third in category and 580th overall with a time of 1.43.29. NNBR AT THE NORFOLK CROSS COUNTRY CHAMPIONSHIPS. Sixteen North Norfolk Beach Runners took part in the Norfolk Cross Country Championships at the Charles Burrell Centre, Thetford, at the weekend. Over the 4.3 mile women’s course, Louise Pegg came second in the Female Masters 50-54 category with a time of 35.17, followed closely by Karen Balcombe in 4th in 35.38. With Rebecca Maun’s 6th place in the Female Masters 45-49 in a time of 34.03, the three of them gained silver in the Female Masters 45+ team competition. Meanwhile, Charlotte Neale ran 28.24 for 5th place in the Female Senior, with Felicity Quinn clocking 29.24 for 12th. In the Men’s competition, run over 6.8 miles, Chris Merrylees, who turned 40 last week, announced his arrival in the 40-44 category with 3rd place in a time of 41.43, followed by Lynton Battrick in 45.08 for 9th. Tony Witmond, also a recent category entrant – to the 50-54 – gained 2nd in 43.57. The NNBR Super Seventies were represented by Jim Hayes who was first in the Male Masters 70+ with a time of 58.04, while soon-to-be-Super Seventy, Sam Weller ran 56.10 for 2nd in the Male 65-69.